The Fairgrounds' Multi-Purpose Building (MPB) is a completely enclosed 125' X 250' building. This is the latest addition to our site and by far the most popular. During the winter months the MPB is set up with exceptional roping amenities and open for riding and roping inside while the snow falls outside. 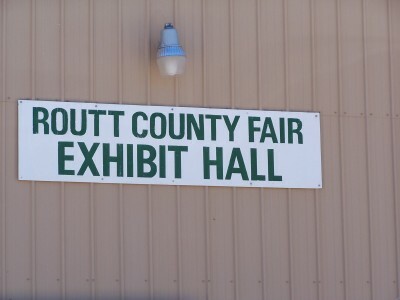 During the county fair it is set up with hundreds of pens holding pigs, sheep, cattle and goats along with show rings and bleachers for spectators.The Routt County Fairgrounds multi-purpose building is open to the public for horse activities and riding according to the monthly schedule. Horses are not provided. The Routt County Fairgrounds multi-purpose building is open to the public for horseback riding unless the schedule says “closed to public.” Horses are not provided. EVERYONE MUST sign-in and out at the self-pay station located in the northwest corner of the building. The Fairgrounds Manager will make regular checks to assure everyone is adhering to the safety and payment policies. RIDERS ARE RESPONSIBLE TO FAMILIARIZE THEMSELVES WITH THE RULES. RIDERS MUST SCOOP AND DUMP ALL WASTE AT THE END OF THEIR RIDING SESSION. CLEAN UP AFTER YOURSELF. NO DOGS. Coin-operated showers, open daily, 24 hours. EComplete with a full kitchen, this is the perfect place for your small and large meetings, wedding receptions, birthday parties, archery, and other events. Covered horse stalls are available whether you're just passing through and need a place to hang your halter for the night, or if you are in town for hunting season and your favorite pack horse needs a room for a week. Horse stalls rent for $10 per night. Renter is responsible for cleaning out the stall when finished. Surrounding the outdoor arena, and the reason these facilities are here today, the race track is diverse in its usage. Traditionally the track is used for horse races during the annual Fair, but it is also used for trail classes, entertainment events and a good old-fashioned tractor pull!